I’m happy to announce that the audiobook version (featuring myself as narrator!) of my third book: Millennials are Ruining the World! is now available on Audible, HERE!!!! If you missed me on Lip Sync Karaoke on The Tonight Show with Jimmy Fallon & Cher, have no fear. It’s right here!!! Weekly showcases continue through Tuesday, May 14th, 2019. Visit the Showcase page for the list of the performers. Speaking of showcases, here’s an interview I did after a recent one. Did you see our Get Out the Vote music video starring Mario Lopez last October? If not, you can view it, here. After successful industry readings in November and June, we recorded the studio casting recording of my new musical, The Diamond as Big as the Ritz. You can purchase it on iTunes or Amazon, and it’s also streaming on most platforms. There are also videos of some of the songs on the Performance Videos page. In other news, my third book: Millennials are Ruining the World! was published in February 2019. It features 24 humorous essays on the generational divide, and it’s totally hilarious. You can buy it, here. It has five 5-star reviews so far! 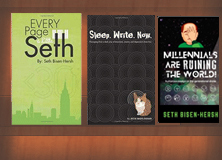 Check out the side section: “Seth Abridged” for links to my new sitcom pilot, my books, my music YouTube channel and my CDs. Or click on the Every Day a Little Seth page to watch the sitcom pilot directly. Please watch and share it with everyone you know, as we hope to get it to a network/streaming platform. You can now get the sheet music to 170 of my songs at the Seth Store! And for those of you who are Ob-Seth-ed, please check out the personal section, which features my ledger blog, picture galleries, my cat: Smee’s page, puzzles I’ve written and more! If you haven’t read my epic trip highlights, here are direct links: Scandinavia, August 2018; India, January 2018; United Kingdom, May 2017; Poland/Austria/Prague, July 2016; Iceland, May 2015; Germany/Paris, August 2014; Ireland/Copenhagen, Sept 2013 and Shanghai, Feb 2011.